Powers up to 2 km of multi-wire fencing. The AS20 is great for shorter fences. It comes with a 2 year warranty and is of excellent quality - made in Germany. There is no separate battery or solar panel to connect. Just place on the ground and push in your earth stake . Connect to the fence and switch on....... The AS20 is very easy to use. If you have a larger fence (remember, it always better to have more power than you need on your electric fence) you may wish to consider the next size up - the AS35. 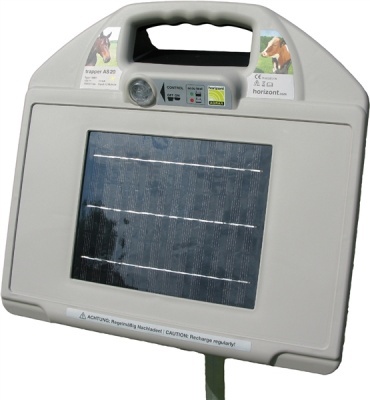 Solar energisers are very reliable in the UK and will run your fence for 3 seasons of the year with no trouble. During the darkest winter months, you will need to give your energiser a few boosts from the mains (adaptor for the mains included). 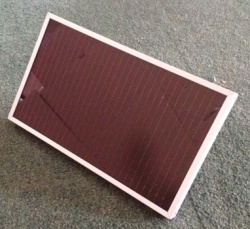 Solar energisers have rechargeable batteries inside. 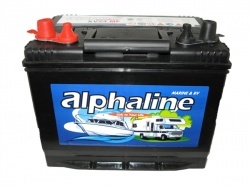 Your energiser will outlive the battery, so eventually you will need to change your battery (much like with a mobile phone). Replacement batteries cost approx. £34. 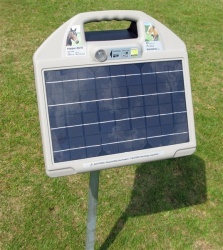 The AS20 comes with all the leads to connect to a fence, plus a FREE 1 meter earth stake that can also act as a mount (the energiser sits very neatly on top). We Say: For short ish fences where heavy 12v batteries are not practical this is a dream.